I was so excited this Sunday morning. It was going to be my first run through the trails of the Rockefeller Preserve of the year. The snow should be gone, the trails should be clear, running conditions are favorable. I leashed up my trusty running buddy, my brothers coyote for a dog Leeroy, and we were off. 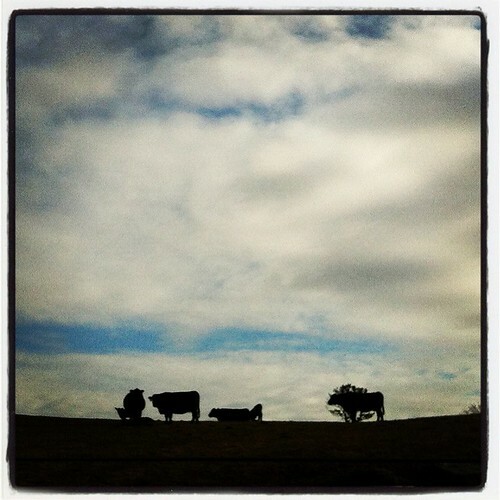 We passed by the cows, meandered through the woods and the farmland and made it to the lake. There was a just a dusting of snow form a passing snow flurry last night that covered the trails here. I went around the bend, and as I was looking at the horseshoe prints in the snow dusted mud, I suddenly found myself falling. I quietly called out to Leeroy before slamming to the ground upper back first, followed by the thud of my head on the frozen mud. Dazed, I stayed down for a moment wondering what just happened, and what to do next. I was three miles away from my car, it was cold out, and I was not dressed to walk back. I didn’t want to bother anyone and call for a pick up from the visitors center a quarter mile away. I only had one option left. Get up, shake it off and run back. Another fall, another lesson learned (so true to life!) When I ran 11 miles on an ankle sprained 2 miles into a run from tripping over the dog. I learned how to run with Leeroy on leash. When I tripped on a curb during a pre dawn run and chipped my front tooth, I learned to carry a cell phone and bought a headlamp. Now, after this spill, I think I need to get a helmet. Or quit being so distracted…or find someone to run with…whichever. The real truth is, it’s incidences like this that make me realize that even though I can do things alone, sometimes I really shouldn’t. So, I sit here now, with a sore neck and bruised elbow, and all I want is a cookie. 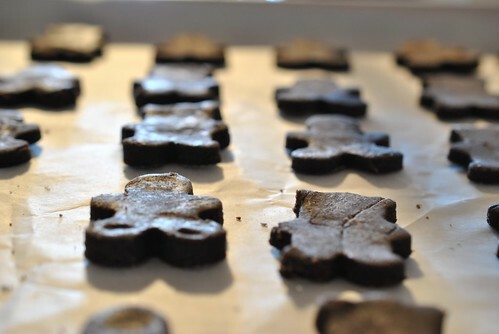 How about some Brownie Cutout Cookies from my new Smitten Kitchen cookbook. Yes kids…she (Smitten Kitchen the blog) has a cookbook and everything looks amazingly delicious. I had to give this recipe a trial run. Put all those ingredients into a bowl and combine. In the bowl of a mixer put: 16 tablespoons unsalted, softened butter and 300g (1 1/2 cups) sugar and beat till light and fluffy. Then add two eggs, one at a time and beating till combined after each one and scraping down the sides of the bowl. Add a teaspoon of vanilla extract and combine. Slowly add in the dry mix to the wet and mix until combined. Pour out the dough onto some plastic wrap, form into a disk and let it chillax in the fridge for at least an hour. After an hour, pre-heat the oven to 350 degF and line sheets with parchment paper. Lightly flour some counter space. Take out the dough and depending on counter space, either roll it all at once, or like I did, break off a good sized chunk and re wrap the rest and put back in the fridge while you work on a bit at a time. Roll the dough out until 1/4″ thick. 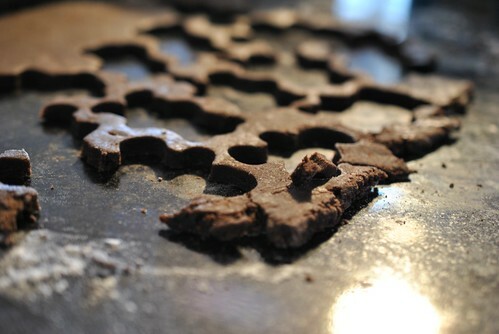 Then stamp out whatever cookie cutter shape you want. Roll up the scraps and repeat as necessary. Into the oven they go for about 10 minutes (mine were done 10 minutes on the dot), until they are no longer shiny. If you overcook them, no worries, they just become a crunchy chocolate cookie. Still good! 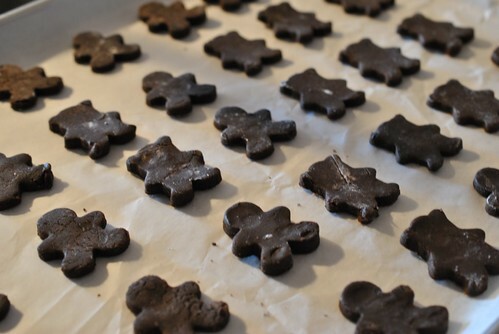 These cookies were pretty awesome and will fulfill any chocolate craving. The thicker they are the more brownie like they are. I started getting lazy with my rolling so I had some that were really thick, and some a bit on the thinner side. I added a 1/2 teaspoon of instant espresso powder in hopes to amp up the chocolate flavor. 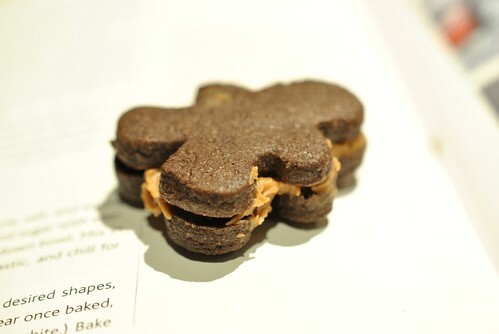 I spread some Speculoos Cookie Butter (trader joes) on the cookie. My friend Alli had actually told me about this, and it is in fact delicious….even straight out of the jar! 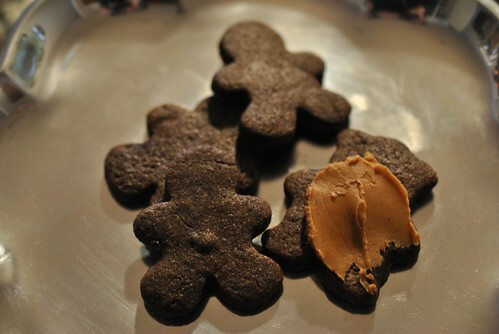 This entry was posted in Cookies, Uncategorized and tagged Brownie Cookies, Cookie Butter, Rockefeller Preserve, Running, Smitten kitchen, Speculoos, Trader Joes. Bookmark the permalink. Love it! You earned a nap, and those cookies. The Rockefeller preserve is a gorgeous place for a run, despite the rampant ice floes. I appreciate that you can take lessons away from your tumbles, but if you start feeling weird, go see a doctor, dangit!! I hope you’re doing better after your slip. The thought of running with a helmet on is a bit silly. I don’t think it would ever be a bother to call anyone if you’re in serious trouble. But I’m glad you bounced back on your feet… and aspired to an awarding treat. 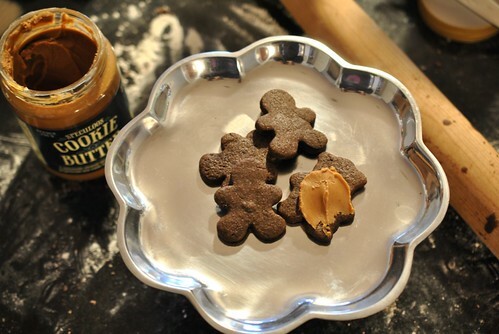 Chocolate and peanut butter always sounds yummy! Be safe! Thanks! I like to reserve the pick up for when I find I absolutely cannot make it back to the car. Let’s hope that never happens!